AoA Audio Extractor Platinum - Audio Extractor, Audio Converter, Sound Recording, Voice Changer, Karaoke Recording, All in one. *** Audio Extractor: Extract audio tracks from AVI, MPEG, MPG, FLV (Flash Video), Youtube, DAT, WMV, MOV, MP4, 3GP video files and save them as MP3, WAV, iPhone Ringtone, WMA and AC3 formats. *** Audio Conversion: Convert audio files between different formats, such as MP3, WMA, WAV, M4A, iPhone Ringtone, OGG and AC3. *** Sound Recording (Capture Audio): Record your voice or any sound from microphone, CD/DVD player and any other input line available with your sound card. Save sound recordings directly to MP3, WAV. *** Voice Changer: Change your voice in real time by dragging the slider. *** Karaoke Song Recording You can select a popular song (WAV,MP3) and sing along with the song. 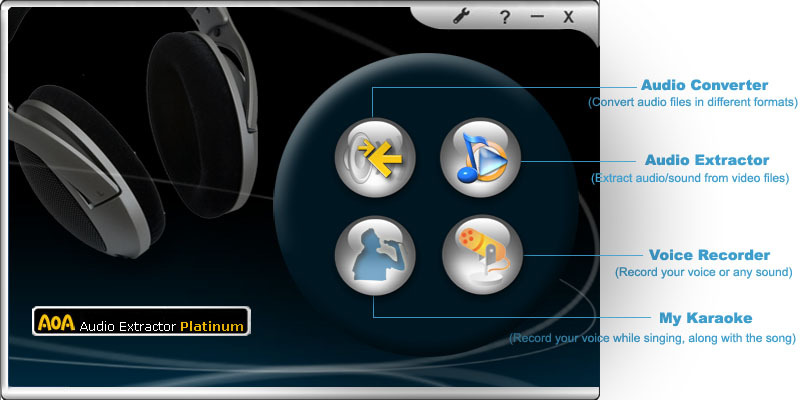 AoA Audio Extractor Platinum records your voice while singing, process your voice with real time voice effects. Leawo MKV Converter is a powerful utility for MKV video conversions, like convert MKV to AVI, MKV to MP4, MKV to DVD, etc. It supports any MKV videos recorded or downloaded, and converts to play smoothly on iPod, PSP, Zune and more media devices.